George V, King of the United Kingdom and the British Dominions, died in 1936 leaving the throne to his eldest son Edward VIII. After being King for less than a year Edward abdicated as the woman he wished to marry had been married before and was about to be divorced for a second time. Rather than cause a constitutional crisis he gave up the throne and married the woman of his choice. The throne then passed to his brother George VI (father of Elizabeth II), whose coronation took place on 12 May 1937. This occasion was celebrated throughout the British Empire, with Carnamah being no exception. Children's sports took place throughout the afternoon at Centenary Park and at their conclusion the children gathered under the Union Jack and the Australian National Emblem. Each child was presented with a Coronation Medal, which were donated by the Carnamah District Road Board - better known today as the Shire of Carnamah. 75 years after the medals were presented to local children one was discovered during weeding in a garden bed at 15 Caron Street in Carnamah, the home of Roxy East (one of our virtual volunteers) and Len Brown. Below is the front and back of the medal, which has probably fared quite well considering its time spent outdoors. "Boys and girls, it is my privilege on this, the Coronation day of King George and Queen Elizabeth, to address you briefly. This gathering is one of many thousands being held throughout the British Empire today, celebrating the Coronation of our King and Queen. I would like your little minds to travel with me into the jungles of Central Africa, where the chiefs and tribesmen are gathered; into the mountainous regions of northern India; into the Arctic Circle of northern Canada and in many other places where like gatherings, some larger, some smaller than ours are being held to celebrate the occasion. Coronation means that on this day in London a ceremony is taking place; it finishes, or has its climax, at Westminster Abbey, where the King and Queen take an oath to serve the British Empire as rulers. I am sure very few of you girls and boys have not in recent weeks seen photographs of the little princesses in the daily press nor have you felt something in you, something born within you that makes you feel proud when you look at these photographs. Little princess Elizabeth may some day be Queen of the British Empire. This takes me back many years to a similar gathering as today. I was a little boy [in Scotland] standing in a line, my mind more on how many races I was going to win than on our head master's address, although the little message he conveyed to us has always stuck to me. He used as his text the word 'Loyalty.' He said then as I am saying to you today:- 'It is the Loyalty of the boys and girls of today that will make the Loyal men and women of tomorrow. It is this loyalty that binds together this wonderful Empire of ours.'" After receiving their medals the children of the district were entertained with afternoon tea and then presented with bags of fruit and lollies. 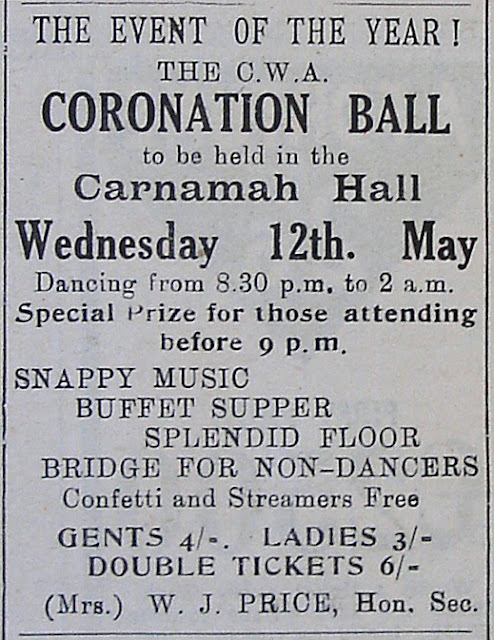 The adults got their turn in the evening when a very large number of people attended the Coronation Ball at the Carnamah Hall. The ball was a massive success with visitors in attendance from as far away as Marchagee, Arrino and districts on the Wongan Hills railway line.